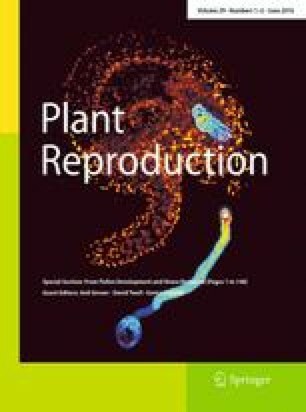 In angiosperms, sexual reproduction is a series of complex biological events that facilitate the distribution of male generative cells for double fertilization. Angiosperms have no motile gametes, and the distribution units of generative cells are pollen grains, passively mobile desiccated structures, capable of delivering genetic material to compatible flowers over long distances and in an adverse environment. The development of pollen (male gametogenesis) and the formation of a pollen tube after a pollen grain has reached a compatible flower (pollen tube growth) are important aspects of plant developmental biology. In recent years, a wealth of information has been gathered about the molecular control of cell polarity, membrane trafficking and cytoskeletal dynamics underlying these developmental processes. In particular, it has been found that regulatory membrane phospholipids, such as phosphoinositides (PIs), are critical regulatory players, controlling key steps of trafficking and polarization. Characteristic features of PIs are the inositol phosphate headgroups of the lipids, which protrude from the cytosolic surfaces of membranes, enabling specific binding and recruitment of numerous protein partners containing specific PI-binding domains. Such recruitment is globally an early event in polarization processes of eukaryotic cells and also of key importance to pollen development and tube growth. Additionally, PIs serve as precursors of other signaling factors with importance to male gametogenesis. This review highlights the recent advances about the roles of PIs in pollen development and pollen function. A contribution to the special issue ‘Pollen development and stress response’. I. H. and T. I. both wrote the manuscript.